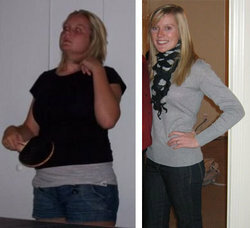 Apyle15 achieved her weight loss through exercise, healthy eating and changing her attitude. Her story shows the benefits of exercising while losing weight. As she points out, “I had never realized how bad my eating habits truly were!” She lost 45lbs and she also acquired a whole new sense of self confidence. I have always been very athletic and involved in numerous sports, which did a great job of keeping me relatively in shape. In fact, I made my college decision to go to Austin Peay State University on a tennis and academic scholarship. Although sports had kept my weight decent (around 145 lbs), I had horrible eating habits. The summer before and during my sophomore year of college I had become a little burnt out on tennis and quit trying as hard in practice and also quit doing any extra activity on my own. Over the course of these months I ballooned to 170 pounds. When I stepped on the scale and saw that number, I nearly had a heart attack. I decided right then that since I had already decided to quit tennis at the end of the season (April 2009), I was going to begin an immediate overhaul of my eating habits and begin an extensive workout regimen. Being as young as I am, I’ve never tried any other “diets” in the past. I made drastic changes in my diet, activity, and entire lifestyle that allowed me to achieve my weight loss goals. First, I began to count every calorie that entered my mouth, even gum! Until then, I had never realized how bad my eating habits truly were. I began substituting fruits and vegetables for sweets and fattening side items. The most important change I made was my attitude. I’ve always heard the saying, “If you feel good, you look good!” and now I really believe this! I told myself just to keep focused and remember that with hard work I can achieve my weight loss goal. I made a list of the goals I had and some simple inspirational tips to keep me going and hung it on my bedroom wall where I would see it everyday. I had great friends, family, and a wonderful fiancé who supported me better than I could have ever imagined. Calorie Count helped me so much once I found out about it. I would always google foods before I ate them to find out the nutrition facts and wound up using calorie count the majority of the time. Once I explored it and got signed up I was so thrilled not to always have to be jotting down the nutrition facts for what I ate on a piece of paper I kept in my purse. Seeing the grades for different foods really helped me to make smarter choices, too. There were a lot of things I thought I was being healthy about, but after seeing the grade and understanding what the numbers mean, I now know I wasn’t being so smart. In my opinion, the most challenging aspect of losing weight is to not get discouraged after the initial weight drop. I lost a considerable amount of weight in the first month or so then didn’t lose much for another month even though I was working extremely hard. This was a trying time, but by remembering my end goal and staying focused on that, I found a way to keep going. I saw early results within the first month. But as for major results, within the first six months I had dropped 25 pounds. I first realized I was a success when it occurred to me that my whole lifestyle has changed. Before, I had horrible eating habits and I was active but I didn’t enjoy it and didn’t understand the true benefits that it had. Now I love eating healthy and the way it makes you feel. Also, I love going for long runs and pushing myself to be better and work as hard as I can. I still have the list of goals and tips hanging in my room. I look at it whenever I don’t feel like running or eating healthy and it reminds me how hard I worked to get where I am now and that I never want to go back to where I was (overweight and under confident!). Losing weight has helped my confidence more than anything – I feel so much better about myself! When I run into old friends that I haven’t seen in years, many of them don’t recognize me. This always boosts my confidence! Also, my attitudes about eating and exercising have changed dramatically. I now find myself making healthy choices without even thinking about it. Stay focused. Keep your eyes on the end goal and make that your main focus. Don’t worry if you don’t lose any weight one week, if you keep working hard it WILL work! Surround yourself with supportive folks. As I mentioned, I had a wonderful support team that helped me so much. When you are trying to lose weight, the last thing you want is someone wanting to eat doughnuts late at night. buying a size 2 pair of jeans. exercise makes you more likely to do your workout regimen. ← Previous Story 110 Pounds Lost: Facing my food addiction!